This article concludes this series on the rites of Good Friday. The previous articles may be read at the following links: part 1, part 2, part 3, part 4. 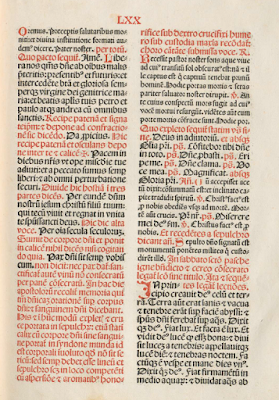 In 1956, Fathers Annibale Bugnini and Carlo Braga published in the Ephemerides Liturgicae a commentary on the Holy Week reform which Pope Pius XII had promulgated late in the previous year. 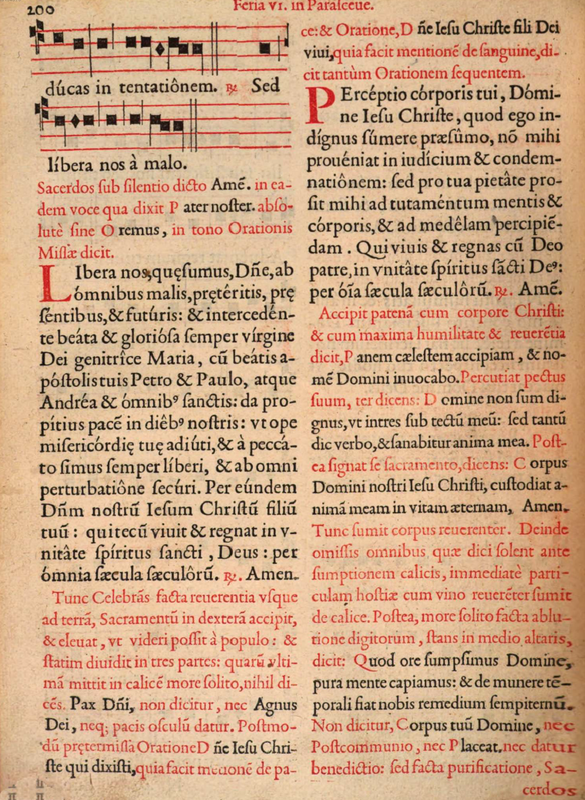 Considering that it is supposed to explain changes which were by far the most significant made to the Tridentine Missal since its first publication in 1570, it is weirdly (one might almost say ‘oppressively’) reticent about what exactly was done and why. 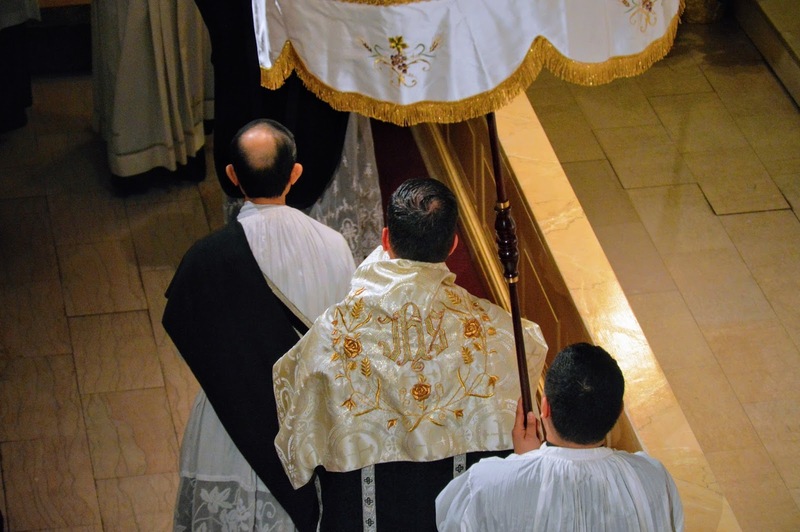 Nowhere is this more the case than where it treats of the last part of the Good Friday liturgy, the so-called “Mass of the Presanctified.” The commentary concerns itself almost entirely with the question of distributing Holy Communion to the faithful, which before 1956 had not been done for centuries. However, even assuming that it was wise, opportune or necessary to restore this, it has nothing to do with the ceremony itself. There is no reason why Communion could not be given on Good Friday within the traditional rite; one could simply consecrate an extra ciborium on Holy Thursday, bring it to the Altar of Repose along with the chalice containing the large celebrant’s Host, and bring it back to the main altar on Good Friday. The sum of Andrieu’s study as it regards the Mass of the Presanctified is as follows. Originally, the Blessed Sacrament was reserved on Holy Thursday under both species for Communion on Good Friday. By the beginning of the 9th century, this custom had changed, and only the Body was reserved. 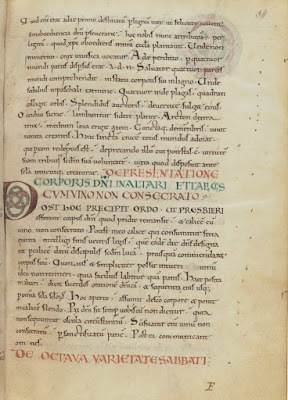 A description of the ceremony which was already old by that period says that the celebrant performed a fraction while “saying nothing”, into a chalice previously prepared by the subdeacon with “unconsecrated wine.” It is first attested in Codex Sangallensis 614 (ca. 800 A.D.), and subsequently in “innumerable” missals and sacramentaries. But these ordines merely describe the ceremony, without giving any explanation of it, and it is “difficult” for us to know if the explanation later given by Amalarius of Metz corresponds to the ideas that originally inspired the rite. This is a radical understatement on Andrieu’s part; there is no reason whatsoever to believe that Amalarius’ theory had anything to do with the creation of the rite. 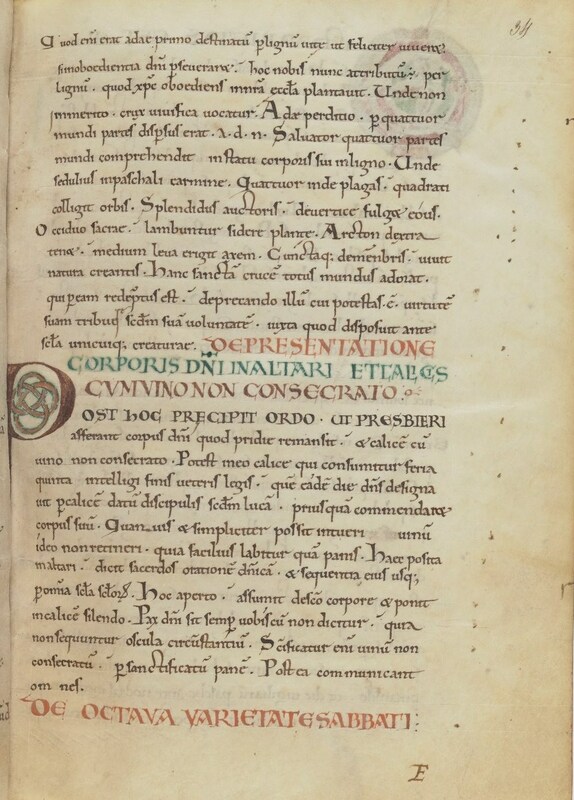 A 12th-century manscript of Amalarius of Metz’ treatise Liber officialis. (Bibliothèque nationale de France, Département des manuscrits, Latin 2401. folio 34r) The words “Sanctificatur enim...” are seen in the penultimate line of the main text. Despite this change of opinion as to how the rite works, Amalarius’ first notion, that the wine is consecrated by the particle of the Host dropped into it, was widely diffused. 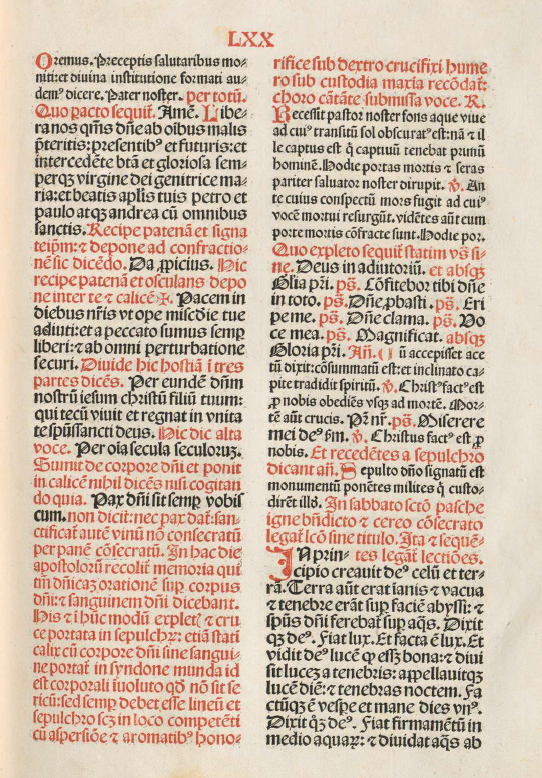 His formulation of it is repeated in the same or very similar words in liturgical books though the Middle Ages and into the early years of printing, right up to the 16th century and the Tridentine reform. 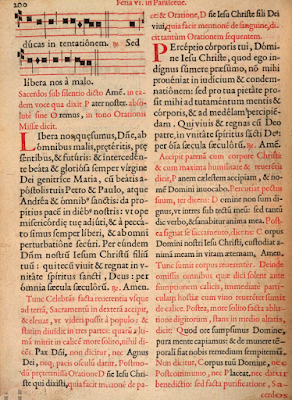 It is even included, with minor variations, in the Ordo of Pope Innocent III at the beginning of the 13th century, the ancestor of the Missal of St Pius V, and in two of the later Ordines Romani (XIV and XV). This is also the text cited by Frs Braga and Bugnini in their 1956 commentary on the Holy Week reform. No one will be surprised to learn that this is not the whole story. It hardly needs stating that the Missal of St Pius V is a product of the Counter-Reformation. It was published to guarantee that Catholics everywhere would celebrate the Eucharist in accord with the tradition of the Fathers and the Church’s perennial teaching, as reinforced by the decrees of Trent, against the Protestants’ rejection of that tradition. If the fraction rite of Good Friday had been thought to contain even a hint of Eucharistic heresy, it most certainly would have been removed. To sum up: while the theory of consecration by contact was known and widely accepted from Amalarius’ time, there is no reason to believe that it is the origin of the fraction rite on Good Friday. The theory itself was repudiated 300 years before the Council of Trent, and this repudiation was definitively accepted. Nevertheless, the fraction rite was retained as the Church’s immemorial custom; clearly, no one thought that in and of itself, it intrinsically expressed the idea of consecration by contact. The editors of the Missal of St Pius V, who would have every reason to remove it if it were perceived in any way to bring the Church’s Eucharist doctrine into disrepute, retained it, and on the same terms in which it had been accepted by the medieval schoolman so hated by the Protestants. And so it remained until 1956. One is left wondering, then: why the sudden change in that year? It cannot be supposed that those responsible for the Holy Week reform were unfamiliar with the work of Andrieu, a well-known and extraordinarily productive scholar; Righetti cites the Immixtio et Consecratio series in his footnotes, and Andrieu’s work on the Pontifical is cited in the 1956 commentary in Ephemerides. “Since there existed … the belief that simply putting the consecrated bread in the wine was sufficient to consecrate also the wine itself, this rite was introduced; when the Eucharist had been better studied, it was realized that this belief was groundless, but the rite remained.” This asks us to believe that at the very heart of the Church’s liturgy, on one of the most solemn days of the year, there exists a rite which originated with a material heresy, and which endured for centuries solely as the result of a blind and unthinking conservatism. If we accept this idea, would we not logically have to ask ourselves what else might be lurking in the pages of the Missal solely as the result of the same blind and unthinking conservatism?